OIG Report: MCOs Cause Limited Access to Primary Care for Medicaid Enrollees! With flu season well under way, access to care to primary care physicians for Medicaid recipients is (as it is always) extremely important. During flu season, in particular, emergency rooms (ERs) are full of people suffering from flu-like systems. Many of those in the ER are uninsured, but many of those in the ER have a valid Medicaid card in their wallet. So why would a Medicaid recipient present themself to the ER instead of contacting a primary care physician? In many instances, the Medicaid recipients do not have access to primary care. Many physicians simply refuse to accept Medicaid. Some managed care organizations (MCOs) refuse to contract with a number of physicians sufficient to address the needs of its catchment area. A December 2014 audit conducted by the Office of Inspector General (OIG) found that access to primary care for Medicaid recipients is in serious question…especially with the onslaught of states moving Medicaid to managed care systems. Our Senate and House are attempting to pass Medicaid reform. The House is pushing for accountable care organizations (ACOs), which would be run by physicians, hospitals, and other health care organizations. The Senate, on the other hand, is pushing for MCOs. I urge the Senate to review this OIG report before mutating our health care system to managed care. Federal regulations require MCOs to maintain a network of providers sufficient to provide adequate access to care for Medicaid recipients based on population, need, locations of providers, and expected services to be utilized. However, as we have seen in NC, the MCOs are not properly supervised and have financial incentives to terminate provider contacts (or refuse to contract with providers). In NC, this has resulted in hundreds, perhaps thousands, of behavioral health care providers going out of business. See MCOs Terminating Providers and Restricting the Freedom of Choice of Providers for Medicaid Recipients: Going Too Far? and NC MCOs: The Judge, Jury, and Executioner. The consequences of MCOs picking and choosing to contract with a select few are twofold: (1) the non-selected providers go out of business; and (2) Medicaid recipients lose access to care and choice of providers. Because of #2, OIG conducted this audit, which, sadly, confirms the veracity of #2. To conduct the audit, OIG contacted 1800 primary care physicians and specialists and attempted to make an appointment. OIG wanted to determine (1) whether they accepted Medicaid; (2) whether they were taking new Medicaid patients; and (3) the wait time for an appointment. OIG only contacted physicians who were listed on the states’ Medicaid plans as a participating provider, because Medicaid recipients rely on the states’ lists of participating providers in locating a physician. Yet, the results of the OIG audit are disturbing, to say the least. 51% of the providers could not offer appointments to enrollees, which raises serious questions as to the adequacy of the MCO networks. 8% were at the location but said that they were not participating in the plan. 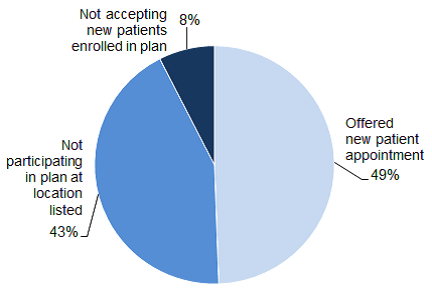 8% were not accepting new patients. The average wait time was 2 weeks for those physicians accepting Medicaid. Over 25% had wait times of more than 1 month, and 10 percent had wait times longer than 2 months. I guess they can always go to the ER. Posted on December 12, 2014, in "Single State Agency", Access to Care, Accountable Care Organizations, Behavioral health, CMS, Division of Medical Assistance, Doctors, Federal Government, Federal Law, General Assembly, Health Care Providers and Services, HHS, Hospital Medicaid Providers, Hospitals, Managed Care, MCO, Medicaid, Medicaid Attorney, Medicaid Contracts, Medicaid Recipients, Medicaid Reform, Medicaid Services, Medicare Attorney, NC, NC DHHS, North Carolina, Office of Inspector General, Physicians, Primary Care Physicians, Provider Medicaid Contracts, Secretary of Health and Human Services, State Plan and tagged Access to Care, Behavioral health, Catchment area, Centers for Medicare and Medicaid Services, CMS, Division of Medical Assistance, Emergency Rooms, Freedom of Choice of Provider, General Assembly, Health care, Health care provider, House, Managed care, Managed Care Organizations, MCO, MCO provider networks, Medicaid, Medicaid recipients, Medicaid Reform, Medicaid Services, NC, NC DHHS, North Carolina, Office of Inspector General, OIG, Primary Care Physician, primary care physicians, Provider networks, Senate, Terminate provider contracts. Bookmark the permalink. 1 Comment.